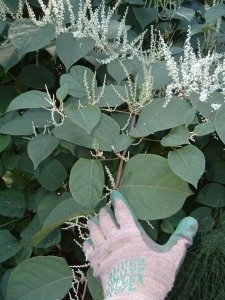 Home » Invasive Weeds » Can you help stop the spread of Japanese knotweed? Can you help stop the spread of Japanese knotweed? The Yorkshire Invasive Species Forum is asking for volunteers to spot Japanese knotweed in the catchment areas of the River Aire and the River Calder in Yorkshire. The volunteer days are seen as an important tool in the identification of Japanese knotweed and Himalayan Balsam, both highly invasive non-native species, and to track the location of the plants along the river banks. If you have no prior knowledge or experience of identifying Japanese knotweed there is identification advice here, which is useful as Japanese knotweed can look very different throughout the year. However, if further information is required, a briefing will be provided by the Yorkshire Invasive Species forum on how to identify and log the findings of the Japanese knotweed invasive plant identification volunteer days. It is hoped that by having catchment-wide Himalayan balsam and Japanese knotweed location information the invasive plants treatment will be easier to manage. Japanese knotweed has been identified as one of the major threats to biodiversity in river catchment areas, and as well as out-competing native species, Japanese knotweed can destabilise the riverbanks, cause riverbank erosion, and therefore pose a flood risk. We are sure that, given current news stories, many of us are keen to do what we can to reduce the risk of flooding along our watercourses at the moment. Contact details on the Yorkshire Invasive Species Forum project can be found here. However, if you do not live near Yorkshire, but are still interested in further information on identification and logging Japanese knotweed locations, there is an app available for smartphone users for logging areas of invasive non-native species. Visit the PlantTracker website for more information. Identification is an important first step to Japanese knotweed treatment, and is a key issue on construction sites where timely identification can be crucial. If you think you have spotted Japanese knotweed and would like further information on the various management options please get in touch.